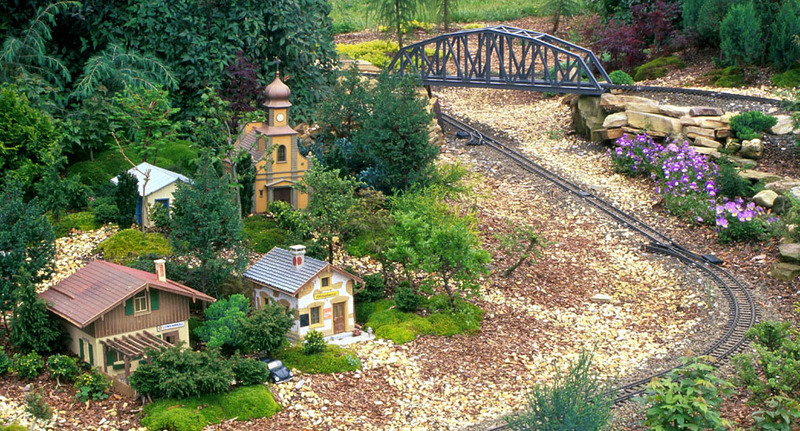 One of the most popular display gardens is the G-scale garden railway. The development process of this display is a microcosm of the garden – the track, buildings and trains were a donation by one of our members. Two Boy Scouts made the creation of the village and the laying of the track part of their Eagle Scout project. Finally, the Living Arts Bonsai Society did all the landscaping to add the finishing touches to this great exhibit. This small European village features a church, fire station, restaurant, and homes amid a waterfall, two ponds (with fish) and a stream. Forests, a bog area, and a farm complete the scene. Over 1,000 plants were used to populate the forests, bog, village landscapes, and farm. Plants include evergreen and deciduous trees and shrubs, as well as perennial ground covers and annuals, all kept in scale with the miniature trains and buildings. The sound of a steam locomotive helps you locate it as it travels the rails, over a bridge, under the waterfall, and through the village and farm. A delight to adults and children alike, the Garden Railway operates from mid-March through December.